Vinayaka Chaturthi is celebrated in the month of Bhadrapada (According to Hindu calendar), starting on the Shukla Paksha Chaturthi. Vinayaka Chavithi is celebrated on Thursday 17th September in 2015. 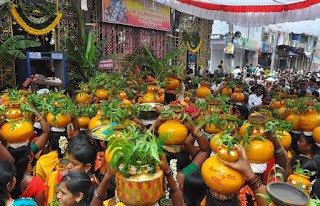 Vinayaka Chavithi is the one of the biggest festival celebrated by the Hindu's. Vinayaka Chavithi, The great Ganesh festival, also known as Vinayaka Chaturthi or Ganesh Chaturthi is celebrated by Hindus around the world as the birthday of Lord Ganesha. Vinayaka Chavithi is Dedicated to Lord Ganesha the God of wealth, wisdom and learning. Lord Ganesha occupies a very prominent position in the Hindu Mythology. Before worshiping any God or Goddess, one should seek the blessing of Lord Ganesha. All the new undertakings, whether at place of work or at home, start by reciting the mantra of Lord Ganesha. He is known as the God of good luck and prosperity. Vinayaka Chaturthi falls in the Hindu lunar month of Bhadra and lasts over a period of ten days. Devotees buy or prepare clay statues of Lord Ganesha, along with 21 types of leaves they are Uttareni, Jiledu, maddi, raavi, ganneru, adavi molla, mamidi, jagi malle, tulasi, umetta, danimma, garika (grass), devadaru, regu, maredu, vakudu, maruvam, maachi patri, vishnu kranthi, jammi, vavili on the day of Vinayaka Chavithi. Then Prepares pindi vantalu with rice flour as 21 small ball shape called undrallu, 21 small rounds called kudumulu, and two rats. They prepare payasam with sugar. On the auspicious day of Vinayaka Chavithi devotees will wake up early finish their regular activities. Then people clean and decorate their houses to place statue of Lord Ganesha at north side. First place a leave on that pour some rice then place the statue of lord ganesh. Then thay decorate with cotton thread, And place the prasadam in front of the god along with the Vermilon (kumkum), Turmeric (pasupu) and gandam. After placing the the total family members sit in front and perform the puja. The place of the worship is specially decorated with flowers. Vinayaka Chavithi pooja is continued upto 3 to 12 days. The last day of pooja Nimarjanam will be observed. In Lord Ganesh Temples mostly grass will be offered to the god throught the year because he likes it.